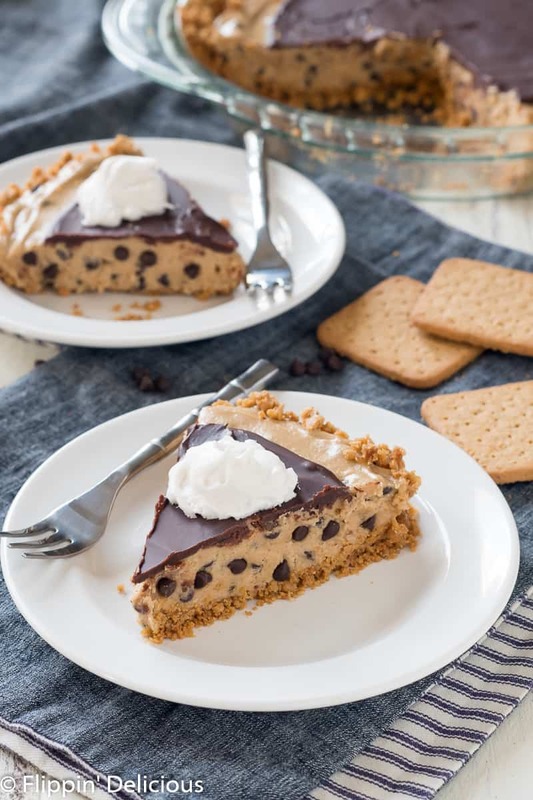 Gluten Free Cookie Dough Pie (dairy free too) with a crisp graham cracker-style crust filled with gluten free edible cookie dough and topped with chocolate. 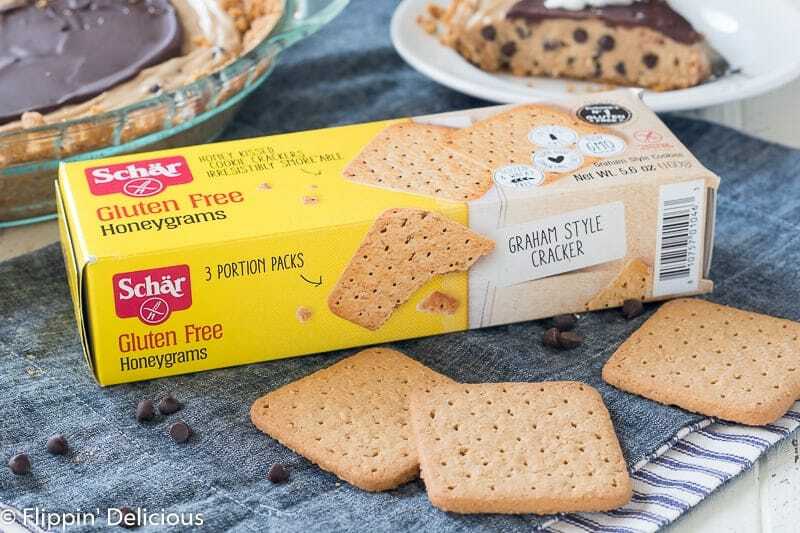 This post is sponsored by Schar. As always, all opinions are entirely my own. 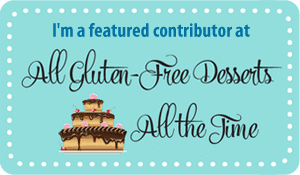 Thank you for supporting Flippin’ Delicious and the companies I work with. Happy PI DAY! Because March 14th matches the first 3 digits of PI (3.14), it has become a holiday for foodies and nerds alike. 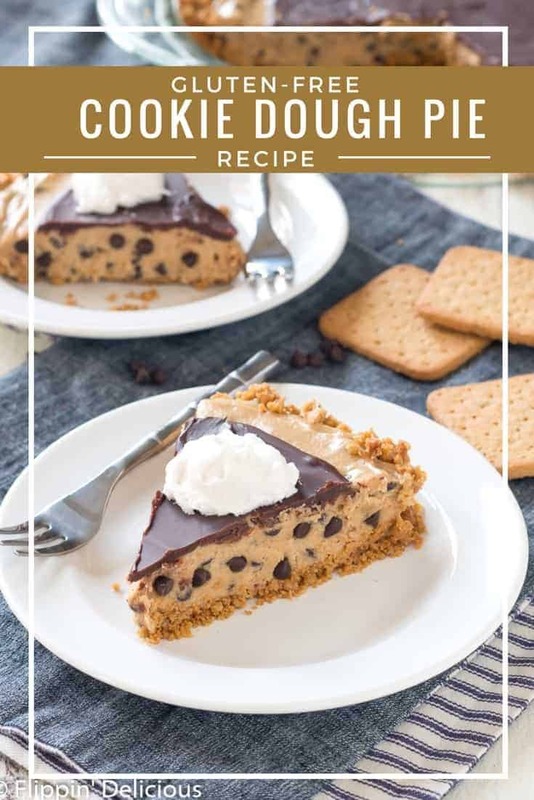 The filling is oh-so-creamy and tastes just like cookie dough! The graham-style crust stays crisp, and the chocolate on top just brings this pie to the next level. As a teen, I was never was a big math geek but one thing I did get was Pi. Archimedes was a pretty cool guy. Maybe it was because he ran through the streets screaming “Eureka” in his birthday suit, but I’ve always remembered him. Also, PI sounds like PIE and that is something I can definitely get behind. 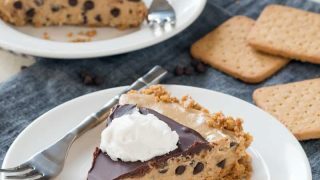 If you are a chocolate fan, you’ll probably love my friend Michelle’s Gluten Free Fudge Pie Recipe. I think it will be on my baking list for PI day 2019! 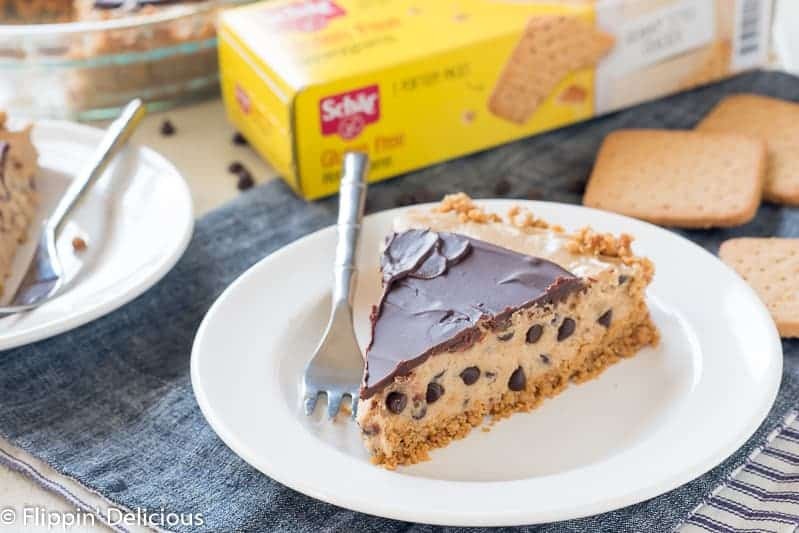 Schar’s Honeygrams make a fabulous crust for this gluten free cookie dough pie. All I did was melt some vegan butter in my pie plate, then mix in a crushed package of Honeygrams. The texture was perfect! Honeygrams are also great for snacking on with a glass of your favorite milk, or my childhood favorite- two Honeygrams with leftover frosting spread between them. I filled my crust with gluten-free edible cookie dough folded with some whipped topping to make it silky smooth. One tip I recently learned is to bake your flour before making edible cookie dough. This helps it to lose any starchy taste and the results are well worth the extra 15 minutes. 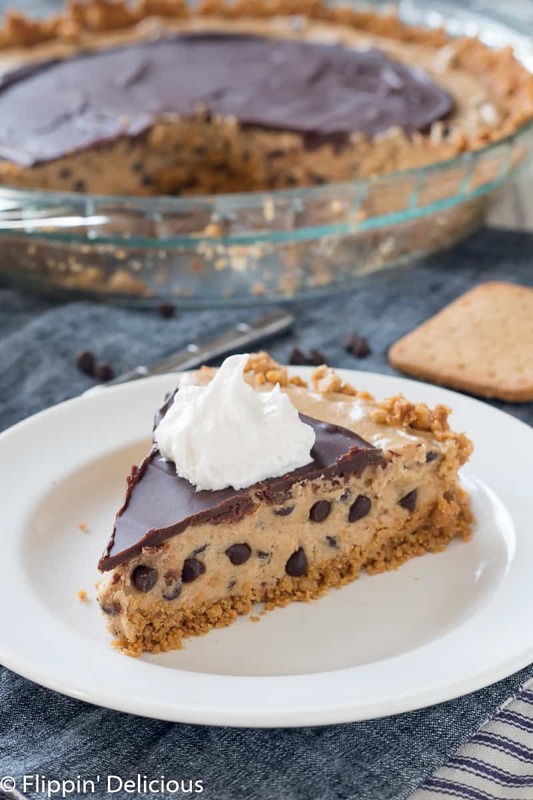 Aside from cooking the flour (which is optional) this gluten free cookie dough pie is no bake! If you want some more cookie dough filled treats in your life, try my gluten free cookie dough brownie truffles, gluten free cookie dough brownies, gluten free cookie dough brownie ice cream, or gluten free cookie dough ice cream sandwiches. 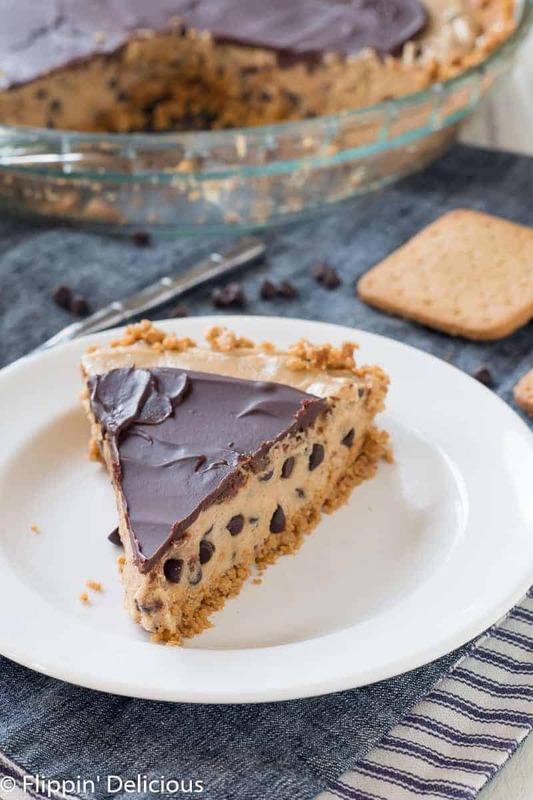 Dairy Free Gluten Free Cookie Dough Pie with a crisp graham cracker-style crust filled with gluten free edible cookie dough and topped with chocolate ganache. In a 9 inch microwave safe pie plate, melt the vegan butter. Mix in the crushed Honeygrams and gently press up the sides and on the bottom of the pie plate. Place in the freezer for at least 10 minutes. 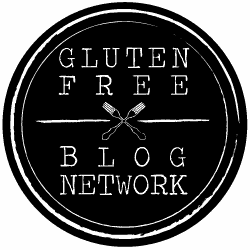 (Optional) preheat the oven to 350°F and place the gluten free flour in a baking sheet. Bake for 10-15 minutes, stirring every 5 minutes. Let cool. In an electric mixer, or in a medium bowl with electric beaters, cream together the butter and sugar. Add in the cooled flour and salt and mix until combined. Add the milk and vanilla and mix until combined. Fold in the chocolate chips. Fold in the dairy-free whipped topping a third at a time. Chill in the fridge for 4 hours (or 1-2 hours in the freezer). In a microwave safe bowl, melt the chocolate chips and vegan butter by heating in 30-second increments. Cool to rooom temperature, and spread on the pie just before serving. What dairy frwe whipped topping did you use? Hi Mindi, I used SoDelicious’s CocoWhip. Happy Baking! Sounds delicious — I can’t wait to try it out! Just out of curiosity, what is the purpose of heating the flour? Hi Heather, heating the flour cooks out some of the starchy taste, and also gives it a little nutty flavor. Some people also cook the flour to kill any bacteria in the flour. Wasn’t able to purchase a flour with no gum today. If I use a rice based flour with xantham gum will this pie turn out okay? Thanks! You should be fine, it may just change the texture or you may need a little less.